I saw a screening of West of Memphis the other night—a documentary about three teenagers who were convicted killing three children back in 1994, and about a criminal justice system that seems committed to maintaining the status quo even at the cost of innocent peoples’ lives. 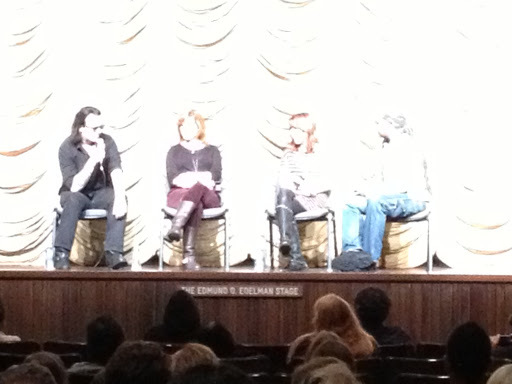 There was a Q and A afterwards. Having been in Los Angeles for awhile, I am fairly used to seeing actors sitting in front of the screen after a movie, talking about portraying other people. I don’t usually bother to take pictures. But it was strangely affecting to see Damien Echols on the stage, and to think–this isn’t an actor. This is a person who was imprisoned for 18 years for a crime he didn’t commit. He spent 18 years in prison, and now he’s on this stage, answering questions. It was kinda surreal, and I wanted to remember it, so I took this blurry overexposed picture with my phone. It was a good movie. If you get a chance, you should see it. Previous Previous post: We Had A Party!